Second only in size, stature and importance to Mexico City, Guadalajara is capital of the Jalisco state and despite its size, is actually a friendly and rather appealing metropolis. Amidst the sparkling skyscrapers and dramatic modern architecture, Guadalajara's historic centre (Centro Historico) is full of character and elegant old structures. In this part of Guadalajara you will find a series of plazas, horse-drawn carriages (calandrias), pedestrianised streets and pleasant green areas, complete with flowers and benches. Locals from Guadalajara and throughout Jalisco are often referred to as 'tapatios' and have contributed greatly to the country's lifestyle and culture. In fact, the region is responsible for the arrival of tequila, traditional mariachi music, and even the country's iconic sombrero hat. Cowboy-style rodeos (charreadas) also originated from the Guadalajara area and are always a time of great excitement. A major industrial city in western Mexico, tourism is playing an increasingly important role in Guadalajara's economy. 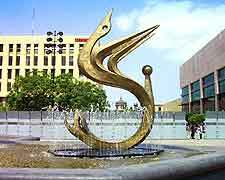 For in-depth tourist information within the city environs, both the State Tourist Office on Morelos and the Tourist Information Booth within the Palacio de Gobierno are good places to find out what's going on around the city and its many suburbs, such as Tlaquepaque, Tonalá and Zapopan. 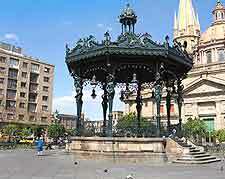 Guadalajara is an enormous city and features tourist attractions for literally everyone. Families are extremely well catered for and the Guadalajara Planetarium and Science Centre is always a good bet and filled with astronomical information. Children of all ages will enjoy the fast rides and enormous Ferris wheel at the Selva Magica theme park, and also the animals at adjacent Guadalajara Zoo. For a more tranquil afternoon out, consider visiting the relatively peaceful Metropolitan Park (Parque Metropolitano) and the Bosque la Primavera forest, where you can stroll, play, picnic and generally relax away from life in central Guadalajara. 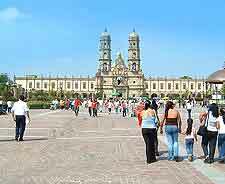 More information about Guadalajara Tourist Attractions. With such a historic past, Guadalajara is filled with interesting buildings and reminders of yesteryear. The city's magnificent Metropolitan Cathedral is a real show stopper and features twin towers and a large central dome. 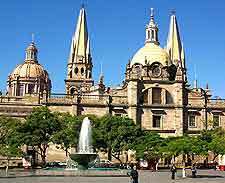 Also of interest for history lovers in Guadalajara is the Government Palace (Palacio de Gobierno) and the Basilica de Zapopan, both of which date back to the 17th century. Built around 200 years ago, Guadalajara's Cabanas Cultural Institute (Instituto Cultural Cabañas) features beautiful gardens, frequent displays of art and weekly ballet performances. Various theatrical events also take place within the Degollado Theatre. More information about Guadalajara Landmarks. If you are interested in finding out more about Guadalajara, then the city's many museums may be of interest and are full of historical information. The Museo Regional de Guadalajara will not disappoint and the large archaeological section is quite overwhelming. Also worth a look are the many exhibits at the Guadalajara City Museum (Museo de la Ciudad), the pottery displays and art works at the Regional Museum of Tonalá (Museo Regional de Tonalá), and the unusual papier maché sculptures at the Sergio Bustamante Gallery. If you would like to sample a little of the local liquor, then pay a visit to the city's very own Tequila Factory (Tequila Sauza) and enjoy a guided tour. 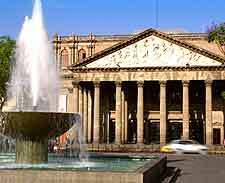 More information about Guadalajara Museums and Guadalajara Art Galleries. Guadalajara offers a number of worthwhile excursions and weekend trips. Nearby, tourists from Guadalajara often take a trip on the Tequila Express train, which transports them into the town of Tequila, where guided tours of Tequila factories are possible, along with many opportunities to sample this classic Mexican spirit. Directly south of Guadalajara, the Lago de Chapala is one of Mexico's largest natural lakes and features attractive scenery and boat trips. There is also a large crafts market in the neighbouring town, along the Avenida Cristiania. Further south you will encounter Jalisco's mountainous region, which has become known as the Zona Montana and a great place for a weekend break, being home to many appealing colonial villages. 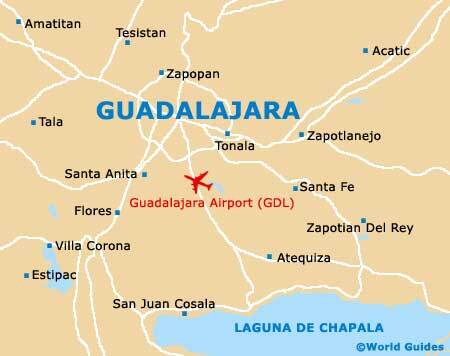 More information about Guadalajara Attractions Nearby.